There are (at least) four known country bands, using the name The Rhythm Rangers, noted in Colorado music archives. The earliest appears to be Cal Shrum's Republic Rhythm Rangers, who got their start in Denver, in the 1930s, on KOA radio. Cal later moved to Hollywood and made quite a career for himself in films. By 1946 he appeared in over 50 western movies. He passed away in 1996 (age 85). Of note - Cal, and his brother Walt, teamed up in the Colorado Hillbillies. Brother Walt also recorded on the Calico label (brother Cal's label). After Cal, Shorty Thompson and his Rhythm Rangers appeared on KOA radio. Shorty also recorded for Mercury and produced a couple of ditties, "Fishin'" / "Smiles Are Made Out of Sunshine" (Mercury 6012), and "Foolish Love" / "Smiles Are Made Out of Sunshine" (Mercury 6135). (OF NOTE: Before he headed up the Rhythm Rangers, Shorty Thompson's group, Saddle Rockin' Rhythm, which also appeared on KOA, featured Shorty's wife Sue, her sister Sally, and a then-unknown guitar picker, Chet Atkins). 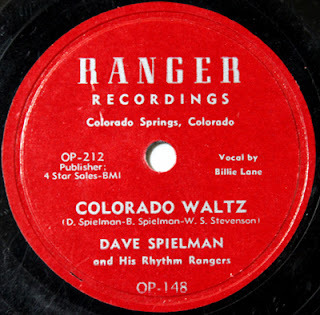 In 1950, Columbine (before it was Band Box) released recordings from Will Graves and his Rhythm Rangers. I have two in my collection - "When the World Has Turned You Down" / "Guess I'm Better Off Without You" (104) and "Iron Horse" / "You Two-Timed Me One Too Often" (108). Then, along came Dave Spielman's Rhythm Rangers. In researching Mr. Spielman, I found a notation of a single on 4-Star (from 1951). "Little Gal (from Across the Street)" / "Rich Man Blues," however I couldn’t find a label number in the 4-Star discography. I found this brief blurb in a 1952 Billboard – “Dave Spielman and his Rhythm Rangers, who are headquartered in Colorado Springs, have two new sides out, one on the Ranger label, and the other on Rocky Mountain. Spielman has also inked a five year pact with Four Star Records." The invaluable Hillbilly Researcher website notes Ranger OP-129 – “Out of Nowhere” / “Ride, Ride, Ride” - (vocal trio featuring Billie Lane with Fran Strubble and Bud Walker), and Ranger OP-148 – “It’s Paw Who Pays"/ “Colorado Waltz." I have another Spielman/Rhythm Rangers 78 in my stash, with the band backing Sonny Le Barron on "Vagabond Dreamer" / "Much Too Old to Cry" (Ranger 506). 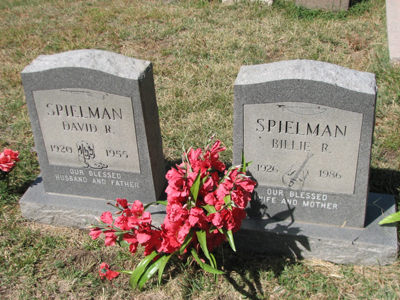 Sadly, Dave Spielman's life was cut short, when he passed away, in 1955, at the age of 35. His wife (and singing partner) Billie passed away in 1986 (age 60). Both are buried in Evergreen Cemetery, in Colorado Springs. 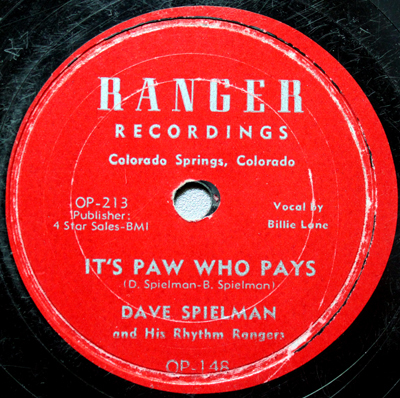 Dave Spielman's contribution to early Colorado Springs country music lives on with the inclusion of "It's Paw Who Pays," on the Bear Family compilation, Foot Loose and Fancy Free.